Conference delegates on their technical visit to Hluhluwe-Imfolozi Park and Thula Thula Game Preserve. Photo courtesy of E. Seekamp. Dr. Erin Seekamp spent a week in South Africa this May confronting this staggering reality at the 38th Annual International Association for Impact Assessment conference. She joined just under 1000 practitioners and academics from around the globe to share and discuss on the theme of “Environmental Justice in Societies in Transition.” Much of the conference focused on best practices for measuring and minimizing environmental and social impacts of development projects like infrastructure, water and energy security, and mining in developing countries, as well as how to enhance the sustainability of these projects given climate change projections such as sea level rise. By identifying how change impacts local resources, culture and identities, we can improve strategies to build resilient communities. The conference urged a deeper consideration into human rights, as protection from changing climate and development often leave many communities vulnerable. Seekamp presented on her work with the SALT team in rural eastern North Carolina as well as her work for the US National Park Service carried out with USGS at NC State University. The former addressed the Rural Coastal Community Resilience framework and how its infiltration has different outputs for minority groups versus predominantly white communities. The latter highlighted the Opti-Pres model, a cultural heritage management tool that combines budgetary and social considerations to optimize historic building preservation. These presentations ignited rich discussion among attendees of the conference, illuminating diverse yet familiar instances of environmental injustice and a salient need for socio-cultural considerations in decision-making. 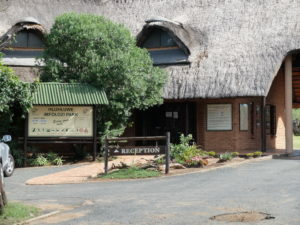 Entrance to Hluhluwe-Imfolozi Park. Photo courtesy of E. Seekamp. Her first time in Africa, Seekamp’s week entailed memorable highlights such as dipping her feet in the Indian Ocean and seeing wild white rhinos. 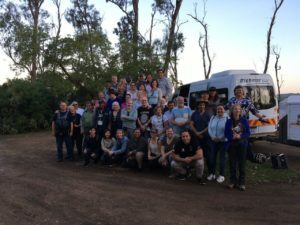 She had the opportunity to participate in a technical field visit to Hluhluwe-Imfolozi Park, the first protected area on the continent, and the Thula Thula Game Preserve. Encroaching mining operations not only threaten these parks and the wildlife within them but also the local Zulu communities, as coal dust pollutes the water and air at dangerous levels. While exploring the park, conference delegates spoke with park management, discussed optimal development options (specifically, ecotourism and expanding park boundaries) for the area, and considered how local poverty and existing mining propositions impact the civil society’s attempts to invalidate and stop this growing coal industry. 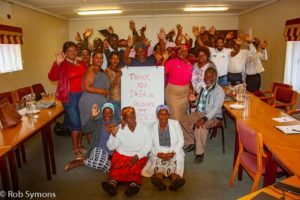 A “Thank you” from community members after a donation by conference delegates on their technical visit. The conference highlighted the daunting challenges that threaten community well-being and environmental health; however, Seekamp returned reinvigorated and eager to incorporate what she learned at the conference in her work. She’s heavily determined to include communities in decisions that are being made at tourism destinations, specifically parks and other public lands, to address these rising issues. Echoing the message from IAIA 2018’s keynote speaker, the Honorable Albie Sach’s talk “Do you have to be White to be Green?”, Seekamp and others will remember his answer: Ubuntu, or “humanity towards others.” We are all the same and important in these efforts. We should see no divisions, but work together for this cause. • Nelson Mandela: Prisoner, President . . . Therapeutic Horticulturalist?